A good writer can create images better than a graphic designer. Whenever we design a Web site, we inevitably ask our graphic designers to give us three comps. Then we, the completely unqualified non-graphic-designers decide which one we “like” best. We might even ask a number of our equally unqualified colleagues to tell us what they think. Then we pay a copywriter a fraction of what the designers get, and ask them to write the copy for the site, knowing full-well that when we get it, we’ll revise it until every ounce of color, every animating metaphor, and every shred of a story is squeezed out onto the ground in a pool of red ink. A good writer can create images and convey meaning better than a graphic artist because the writer has the richer toolset. Put down your red pen. Trust your copywriter. If you’re designing a new site or refreshing an old one, it’s time to be a little daring. Tell the designers to hold on until you’ve completed the copy. They’ll look at you like you have an arm growing out of your head. THEN, start interviewing copywriters. Tell them that you’ll pay them to develop three different versions of your Copy Body, the document that contains the text from which you will take your copy when writing headings, text, offers, emails and any other Web-based communications. The interviews will be short. You’re looking for a certain reaction. When you present this proposal to the right writer, their eyes will flash. A smile may creep across their face of its own will. Be careful, though. If they say “You’ll pay me?” you’ve gotten a false positive. You want to choose the writer who feels that you’ve just opened the door to their a cage of mediocrity. If you let them out, they’ll take you with them. Be very clear about what you’re trying to accomplish as a business and what your visitors are trying to accomplish. Give them a set of personas if you can. Once you have your three copy “comps,” do not allocate time to have the writing revised by a committee. Do not attempt to combine the best from each. Do not seek to insert superlatives that declare you the “leader,” to be “unique” or “innovative.” If you have to say it, it ain’t true. If you have the right writer, one of your choices will be far out, one will be written in business speak, and one will be somewhere in between. Throw away the one written in business speak and consider the remaining two very carefully. Select the copy body that best illustrates your value proposition, the one that captures the essence of your company without stating it. Look for metaphors that can be applied to a variety of your benefits. Seek a story that can stitch every page together into a coherent theme. Then fix the inaccuracies, and leave everything else alone. Does this sound scary? Wait till you see what’s next. If you’ve selected an engaging copy body, it’ll be really clear to the designers what their designs should express. They can create real images from the ones your writer paints with words. They can guide your visitor through the story with navigation. They can throw away stock photos of pretty people and choose images informed by metaphor and analogy. Give them the copy body, the corporate style guide and tell them to create a design. One design. Sure, you’ll make decisions along the way and maybe even significantly change the first comp, but try to let them do what they do well. If you realize the immense advantage that powerfully written copy gives you, consider investing in some testing. Implement two of the three copy bodies on your home page and on key landing pages. Use analytics to see which makes visitors stick and which generates more leads or sales. Which has the lower bounce rate? Which home page generates more page views and more time on site? Which has the higher conversion rate? There is no better way to know if you’ve made the right decision than to test. And you may need some proof when your colleagues tell you that your copy isn’t “corporate” — and they mean that as a criticism, not a badge of honor. Do you know a great copy writer? Do you have a success story or test results that demonstrate the power of effective writing? Let us know in your comments and I’ll feature you in an future post. It seems crazy to be the first to comment on a post that’s nearly six years old. I’m only sorry I didn’t discover this wisdom before now. As a B2B copywriter who writes a lot of web copy, I really like your approach. I especially love your suggestion to not claim in your website copy that you’re a leader or that you’re innovative. I work with a lot of technology companies, and this is often a battle. If only people could see how much this language makes them all sound alike. I also love your idea to hold off on design until you have the key elements of copy more or less established. Well done. I’ve been enjoying your blog for more than a year. Looks like I need to dig deeper into the archive to discover some of the good stuff I’ve overlooked. Thanks. Dave, it’s never too late to comment! I added this to the mini-course because it is evergreen. Things haven’t changed much in 6 years, unfortunately. Dead link.. would love to see : Give them a set of personas if you can. I would love to take this approach the next time I manage a site build. My concern is that most designers will want to do things their own way and might not be very compliant with the idea of using someone else’s creativity to form their own, if that makes sense. Have you ever run into this issue using this method? All other things considered, this sounds awesome. I have an amazing copywriter who would produce great inspiration for design choices. As it is, his copy speaks so much more boldly than the designs I have to put it on, and it’s sometimes an awkward combination. 1. Keep the comp copy short, like a headline and paragraph or headline and some bullet points. 3. Don’t forget the images. Copy should include image concepts. A designer’s job is to present the ideas, like a draftsman. I hope you’ll let me know if you have a different experience with this process. There seems to be a grammar error here somewhere. Just getting into the course, but coming from an Developer/SEO background, would like to know whether you consider keyword researching defining your body content? If the keyword research helps you get into the mind of your visitors, it’s a perfectly valid way to shape your copy. 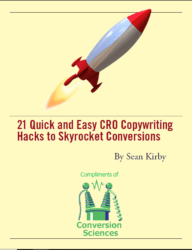 If it’s the only thing you use to guide your copy, then your visitors are going to bounce. They don’t want to be manipulated, they want to be understood. My big question is, “where do we find good copywriters? !” – how do you find people you like, and trust? 1. What is your uncovery process? It should include talking to your sales and customer service people, reading all ratings and reviews, interviews with customers, and reading chat transcripts. 2. What high-performing copy have you written? If they can’t identify which of their projects resulted in more revenue or leads, they probably aren’t right. 3. How do you evaluate your projects? They should be able to talk about conversion rates and bounce rates. For email projects, they should focus on both click-through rate and conversion rate. They should know what a landing page is. Then, you have to trust them. Don’t rewrite. Only correct mistakes. It does help give me a framework for evaluating quality. Thanks! I’m working to start a consultancy which helps businesses get past their horrible web presence (probably focusing on clients who have ugly/ineffective “brochure sites” as your book puts it) and having a short list of brilliant copywriters is a must! I’d like to get a plan put together for my clients, then hand their info off to talented writers and artists to carry out the tasks. Do you have a recommendation as to where I should start looking for good writers? You might start with AWAI (http://www.awaionline.com/). Also, Karon Thackston trains writers (http://www.marketingwords.com/blog/) and may be able to connect you. Thanks Brian! I really appreciate the info. Do you still approach copy this way? Is this something you do in the CRO process as well? Enjoyed chatting this week at the ConversionXL conference, thanks! We don’t write copy for our clients, but I did use this approach when revising our website at conversionsciences.com. We also use this approach to extremes when writing headlines. We will write 10 or 20 headlines to come up with good CRO candidates for testing. Unfortunately, no copywriters have stepped up publicly to say they’ve tried this approach. Perhaps it requires too much work up front. Perhaps it is too risky. Perhaps the best copywriters don’t really need to do this. Those writers who have been traumatized by their clients should see this as a way to break out of their mold. Writing copy is part science, part art. And the real alchemy happens in the mind of the reader. We want to create our own mental pictures from our own understanding. That’s what makes sense to us, and we like things to make sense. Writing copy requires me to appreciate the reader’s own power of creativity, instead of being overly fond of my own. Now that is inspiring. Thanks. Wow, great post. I just discovered your blog yesterday and I really like how you gamified the new subscriber process. Very clever. Also, this is a great post for anyone looking to build or redesign their website. Everyone always starts with design and tries to make the copy fit. I appreciate sharing a wiser approach. Thanks, Marcus. It turns out to be a hard direction for writers to take. It’s different and requires a confidence that many writers don’t have. But we need confident writers badly! Hi Brian, great stuff, what happens if you are just starting out and are bootstrapping and are short on money? If you are bootstrapping and just starting out, you have to get the most for every hour you work. You need to charge a lot for each hour you work. This means that you have to get really good at building value. Be expensive, and if you’re not closing clients, then you need to do more research into building value. Writers who understand analytics, measurement and testing command higher rates. You might as well start up the learning curve with your site. Thank you Brian. Do you work with agencies? I’m just starting out and the most important thing for me is I know my clients are getting great value. If that means subcontracting work out and having someone else get paid, that is fine. I want to learn to be the best I can be, that way when I do work for someone I know in my heart they are getting great value. Ron, we have had great success working with agencies like yours. There is room for all of us in the website optimization marketplace. Good article. Enjoying the course, Brian. I love the advise to throw out “business speak”. What is interesting to me is that each generation the same principles must be taught. 30 years ago, at the first agency I worked for, the owner used to tell us “let the designer’s design.” I believe you are suggesting only one design be worked up — what would be interesting is an experiment with the two final version of copy given to two different designers… then testing one against the other. The approach you’re talking about changes too much, in my opinion. We’ll always wonder why the winner won. Was it the design or the copy? This is great timing for me. I have been wanting to re-think my site for awhile, but every designer I have is just not getting it. I’ve also been thinking through the pivot in my business model. So I copied all my content and brutally going through it in paper and pencil to get it to focus. I do it to my customers, but I don’t do it to myself. This is fun stuff. Thanks, PJ. It’s always hard to read the label from inside the bottle, as the Eisenberg brothers are fond of saying. Nobody understands this. It’s annoying. If more web pages were written like blog posts, we’d have entertaining, educational copy and supportive images. The designer just needs to get the eye to the important parts of the message.